Sperm whale which is swimming in a cup! Did you know the excrement of the sperm whale is considered one of Earth’s best restorative medicines? The motif of this product is a sperm whale dreaming a peaceful dream somewhere in the deep sea… as you enjoy the best restorative medicine on Earth! You can conveniently enjoy tea time with tea gently brewed through holes in the dreaming whale’s stomach.The whale’s detachable water stream-shaped muddler can be used for stirring or decoration. 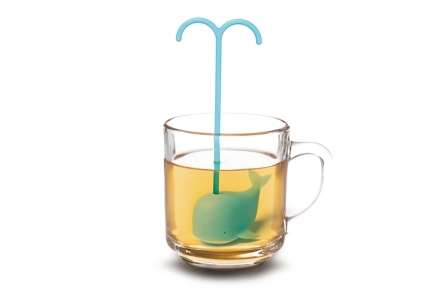 The Dreaming Whale Tea Infuser is made of a harmless and eco-friendly food-grade silicone.